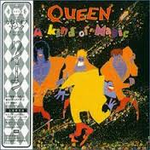 "A Kind of Magic" primarily functioned as a musical backdrop for the movie Highlander, but unlike Queen's other motion picture soundtrack (1980's "Flash Gordon"), the album doesn't contain a single instrumental--they're all fully realized songs. Although it's not quite on par with their time-honored offerings from the '70s and didn't chart well in the States, "A Kind of Magic" still contains more than a few classic Queen tracks. On their early 1990s tour for their hit album Empire, Queensryche performed its 1988 predecessor, Operation: Mindcrime, in its entirety. Years later, Mindcrime is still regarded as a masterpiece, as is this live counterpart. Each song stands on its own, yet collectively contribute to a powerful statement. In the live setting, Queensryche's aggressive edge comes forward flawlessly. Vocalist Geoff Tate is commanding and emotional, while Michael Wilton and Chris DeGarmo's guitar work is immaculate. Bassist Eddie Jackson and especially drummer Scott Rockenfield add progressive, unconventional rhythms. "Operation: Livecrime" was originally released as this limited-edition box set with a CD and video and quickly became a collector's piece.